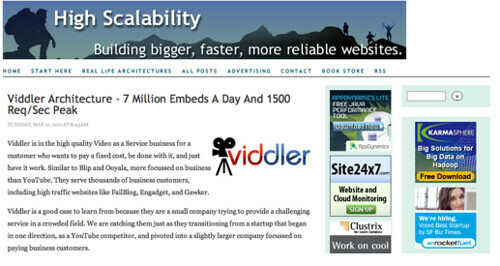 It shows the good, bad, lessons and future of the Viddler platform from a technical aspect. Some folks might frown on this as TMI… I tend to side on transparency + honesty always winning. Would love to hear your thoughts on TMI vs. Transparency FTW. Thanks for the mention Rob! Rob, I am on the side of Transparency 100%. Love this! I would like to thank you for the efforts you’ve put in writing this website. I am hoping the same high-grade blog post from you in the upcoming also. In fact your creative writing abilities has encouraged me to get my own website now. Actually the blogging is spreading its wings rapidly. Your write up is a great example of it. Wonderful post. I am searching awesome news and idea. Seldom seen such a piece of the pear, so white, so beautiful, trees swaying in the wind, a lot of bees during the shuttle, collecting cheap jordans online pollen, or a beautiful butterfly fluttering, gently breathing, is full of the fragrance of gladdening the heart and refreshing the mind, from time to time, the wind gently brushed the oboro cheap jordans graceful face, eyes closed., is full of white, one after another, or crowded into the sky, or low Lian eyebrow, like the gentle woman, like a little bird cheap sneaker clinging to the branches, adorable, “stolen pear Rui three points white, borrowed a wisp of soul”, think of Dai Yuceng the pear description, not from thought, but also really want to use a particular method, the stolen white pear fragrance, the pear, so lightly, seems to have no, is so fascinating. The concept of scalability is desirable in technology as well as business settings. The base concept is consistent the ability for a business or technology to accept increased volume without impacting the contribution margin. Thank you for another informative website (Frankie). I’ve a undertaking that I am simply now operating on, and I’ve been at the glance out for such information. Many open source and even commercial scale-out storage clusters, especially those built on top of standard PC hardware and networks, provide eventual consistency only. I rarely drop responses, however after reading a few of the comments on Bucket List Check! online social sites, I’d like to follow you. Most Facebook users are teenagers who do not have a lot of money to spend. The following are four prime reasons why you should be using Pinterest, including examples of practical applications:. and include a blurb of the case study or testimonial. Thanks for finally talking about > Bucket List Check! High Scalability Mention | Robert Sandie < Loved it! After checking out a number of the blog articles on your blog, I really appreciate your way of blogging. the near future. Take a look at my web site as well and tell me how you feel. The elevator pitch is often a short statement that could explain your small business, one that is used in case you got in the elevator in the grass floor along with ran into a well used friend whom asked what we were currently doing. In the work 1 week you usually wear elegant corporate apparel. You don a coat, a tank top, pants, and a new tie should you be a gentleman; or tank top, skirt and women's high heel sandals should you be a female. When your week can be finally around, you want to relax, dress casually and still have fun. The poor will soon die out of Punjab due to uncontrolled inflation. Every shop has its own rates and it is the race to become the most wealthy by being the most corrupt. When Moonis Elahi was in government, prices were controlled throughout the province but today every shop keeper has his own rates.. Even the products you revealed could have been done (or were done) in many different methods, and using different components. Thanks for posting this blog Robert. you are really an awesome blogger.